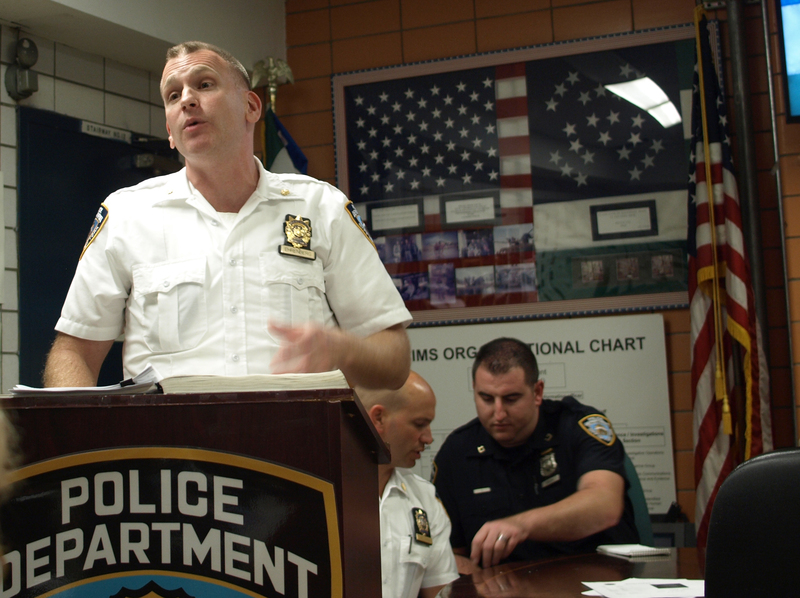 In the first 13th precinct community council meeting after the summer break, the precinct’s commanding officer, Deputy Inspector David Ehrenberg reported that after a mostly uneventful season, crime is up 5.2 percent this month. However, he added that crime is down for the year overall. Grand larcenies, traditionally a problem for this area, were up this month but are also down 7 percent for the year and decreased during the summer, Ehrenberg said. Identity theft is the most common type of grand larceny and the deputy inspector noted that the precinct is still having problems with thieves stealing debit card information with card scanners taped over ATMs. When a resident at the meeting inquired about the bank’s awareness of the problem in their own ATMs, Ehrenberg added that they weren’t necessarily at fault for missing it. Ehrenberg emphasized that residents should call 911 when they encounter one of these skimmers, which are easily recognizable because they are flimsy and attached with double-sided tape. Felony assaults have also been a problem this summer but Ehrenberg noted that in most cases, the fights involved people that knew each other. The increases are also due to assaults of EMTs at Bellevue and the shelters in the area. Grand larceny auto is also up, with nine cars being stolen within the precinct this month, compared to six that had been stolen by the same point last year. Ehrenberg noted that there seems to be a trend there and that it’s mostly rental cars that are getting swiped. He added that residents don’t have to worry so much about a car they have rented being stolen because most of these incidents have occurred in the locations where the cars are picked up. As in the past, grand larceny of unattended property continues to be a problem for the precinct. “There are still a lot of laptops being left in restaurants and coffee shops. You’re not going to leave $2,000 in cash just sitting there, so don’t leave your laptop,” Ehrenberg warned. Residents at the meeting were curious about the impact of the mayor’s Vision Zero plan, which was introduced over the summer. Captain Steven Hellman noted that since Mayor de Blasio has been in office, the precinct has seen decreases in collisions this summer. There is currently an arterial slow zone on Seventh Avenue and Sixth Avenue will be a slow zone this December. As in most community council meetings in the past, residents also expressed their frustrations about cyclists who don’t follow the rules of the road, often riding on sidewalks and without lights at night. One Stuyvesant Town resident said that he’s been seeing delivery people riding their bikes recklessly near his building at 21 Stuyvesant Oval. Police Officer John Sedita said that the NYPD has a good relationship with Stuyvesant Town’s Public Safety officers and would talk to them about the issue. Another resident, though, had a suggestion for those two-wheeled officers as well. “Remind Stuy Town security that they need lights on their bikes, too,” the resident, who didn’t want to be identified, said at the meeting.